Basement Systems is the world leader in developing and providing products that result in dry, below-grade space. The company has a network of more than 300 dealers throughout the United States, Canada, the United Kingdom, and Ireland. 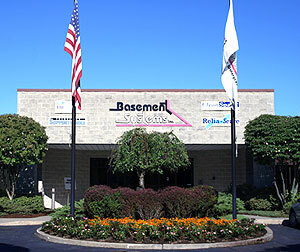 Basement Systems trains and certifies its dealers, giving them access to the company's numerous proprietary products and procedures, including the TripleSafe Sump Pump System and WaterGuard Basement Waterproofing System, both winners of innovation prizes. The company won the Better Business Bureau's prestigious National Torch Award for Marketplace Ethics Finalist Award in 1999. Basement Systems is in business since 1987 and holds 25 U.S. patents for innovations in wet basement repair and crawl space repair industries. In May of 2007, Basement Systems Inc. purchased the Total Basement Finishing (TBF) basement finishing system and began recruiting the country's best home improvement contractors. There are now 30 dealerships across the U.S., who install the award-winning TBF basement wall, floor, and ceiling system -- a complete package and superior products! Connecticut Basement Systems is the largest basement waterproofing, crawl space waterproofing and moisture control company in Connecticut for a reason. We've been doing quality basement waterproofing, crawl space encapsulation, basement finishing, and dehumidification for 20 years, serving more than 20,000 Connecticut residents. We've built a great reputation for honesty, integrity, and high-quality workmanship. Call us, and from the first phone call you'll be greeted in a friendly and professional manner. Our system design specialists will come to your home on your schedule and find solutions to your basement or crawl space problems, and our trained team of production specialists will handle all the installations and maintanence for you. As a basement waterproofing contractor in Connecticut, we know that our integrity and honesty have made us as successful as we are. Winning the CT Better Business Bureau's Torch Award for Marketplace Ethics three times demonstrates our desire to help customers solve their wet basement or crawl space problems to the utmost of our abilities -- it's exactly how we would want to be treated. A Full Service company with complete package and a superior product! Does your waterproofing contractor have a full-service Service Department? As part of the decision process of hiring a waterproofing or crawlspace contractor, the warranty is important, as is making sure that the company has a service department to maintain the system. Most waterproofing contractors in Connecticut offer lifetime warranties, as do we. However, we understand that the best warranty is the one you never have to use -- especially in the case of basement waterproofing. The only time you need to use the warranty is when you get flooded -- exactly what you invested in originally to prevent! A service program from a professional service department can maintain your system through the years to keep it in optimal working order. 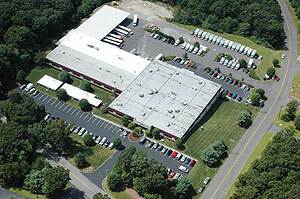 Make sure that service and an annual maintenance program is a real part of the company's philosophy. Extreme Makeover: Home Edition Sundays, 8/7c on ABC. Basement Systems, Inc. has been awarded 25 patents for the many unique products developed specifically to prevent basement water damage and repair crawl spaces from damaging mositure problems. The company has won many awards and patents for their innovative products and services, including being a finalist for the national Better Business Bureau's prestigious National Torch Award for Marketplace Ethics. Basement Systems has also won 22 quality and innovation prizes for products and services. In Connecticut, where the company headquarters is located, the company has won the Torch Award for Marketplace Ethics three times. Every Basement Systems' sump pump system features a patented air-tight sump pump cover and sump pump tank or sump pit, patented WaterWatch alarm, market-leading cast-iron Zoeller sump pump, and patented floor drains. Our highest quality sump pump system with triple protection for your basement. A DC-operated battery backup pump for extra protection. Basement Systems offers great sump pump solutions for your basement! The SaniDry basement & crawl space air system dries and filters the air. 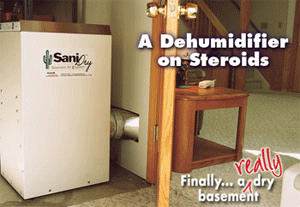 With SaniDry you set the relative humidity level to prevent mold growth. If your basement, crawl space, or entire home smells damp or musty, or you suffer from condensation problems, we have a solution! Damp, Musty Odors? 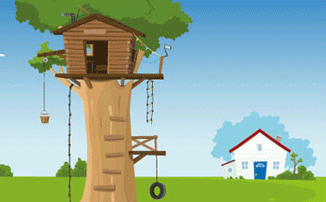 - Mold and mildew cause this damp, musty smell. If you eliminate mold, you will eliminate musty odor, because molds are musty smelling fungi that thrive in moist conditions. Keeping humidity down reduces the chance for mold to grow. In general, mold will not grow at less than 50% relative humidity! Dehumidification is the key. Of course, any groundwater, plumbing or other leaks should be fixed as part of a strategy to eliminate mold. 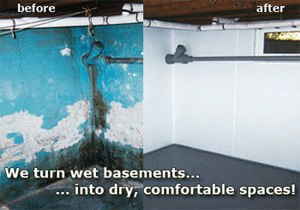 If you suffer from a wet basement, we can help! A wet basement is a common problem in all types of basements - from poured concrete to stone to block - and we've dried thousands of each type. Fixing a wet basement is not a do-it-yourself project. It takes hard work, and a lot of specialized knowledge, skill, and equipment. Learn what is causing your basement water problems and the methods to repair a leaking basement by having a certified Basement Systems dealer give you a free wet basement inspection and estimate on the solution to your leaking cellar. A dry basement will protect the investment you made in your home as well as enable you to use the space for storage or for a basement finishing project to gain additional living space. If you suffer from a damp or wet basement, mold and mildew in your home, or uncomfortable basement living space, let one of our specialists assess your problem and educate you to the causes, problems, and various wet basement solutions available. Our specialists will guide you through our multimedia presentation, Basement Vision, where you can actually see how your wet basement can be transformed into a bright, clean, comfortable, and, of course, DRY healthy and usable space. If you're looking for a way to prevent crawl space moisture, you're in luck! Eight of our system design specialists and service people have won the CT BBB's Superior Service Awards for individuals who have gone above and beyond in servicing Connecticut residents. So if you're calling for a free estimate and inspection for your wet basement or damp crawl space, or for service on your current system, you'll be pleasantly surprised at the great service you'll receive. Check out our A+ Rating on the BBB! We service Connecticut and Westchester County, New York for basement waterproofing, basement refinishing, and crawl space repair. 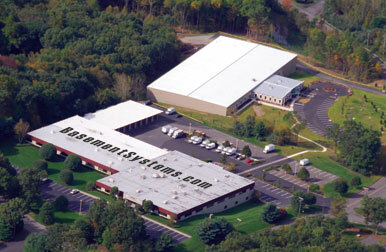 If your property is not located in Connecticut, please visit the Basement Systems National Headquarters Web Site.